I happen to love a beautiful cheese display. The type that is so artfully arranged you are just drawn to it. Here are some tips for choosing cheeses and creating a dramatic presentation that will impress your guests. Find a great local cheese shop and get to know the staff. Cheese, like wine, can be intimidating, as there are so many different kinds and they don’t all pair well together. By finding a good local shop you can get to know your cheese purveyor and he/she can guide you in your selection process. Living on the shoreline of Connecticut, I use The Cheese Shop of Centerbrook. Have three to four cheeses for guests to select from. I always like to have a brie style, a goat (my favorite is Humboldt Fog), a hard cheese and a blue cheese. Never pre-cube cheese as it allows the pieces to dry up. Present the cheese in whole pieces with the rind partially removed. 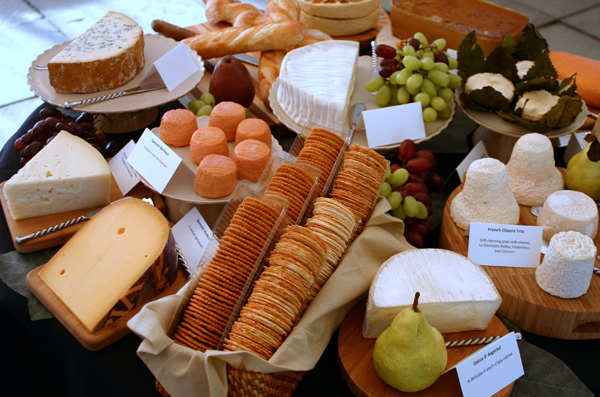 Arrange both sliced breads and crackers around the cheese so that guests can have different textural experiences. Include a selection of dried and fresh fruit on your display. Dried apricots, fresh strawberries and green grapes look lovely together intermingled with the cheese. Always use cheese papers so that your guests know which cheese they are eating. Have a different cheese knife or spreader for each cheese so that the flavors do not intermingle. Add a fruit jam or acacia honey to the display to take the flavors to another level. A little honey spread on a young Parmesan cheese is amazing! Be creative, and remember that to add visual interest and draw your guests’ eyes to the display, your largest fruit (such as a large bunch of grapes) should be placed off-center. If you live on the shoreline of Connecticut, I urge you to stop in to The Cheese Shop of Centerbrook and speak with Paul Partica and his staff. They are truly experts in their field, and love to welcome patrons in to sample some of the many, many varieties of cheese they offer. In addition to the chesses, they offer a wonderful array of charcuterie, spreads, jams, olives, coffee, breads and more. We are coming to the end of summer and before we start looking into comforting fall recipes leave me your question about all your summer cooking dilemmas. Are you burning chicken on the grill? Did you end up trying to make your own ice cream and it came out watery? Ask away it’s Friday cooking dilemma day here on The Elegant Occasion. Kirsten - We have a great grill, but now we don’t eat meat. Any ideas on how to keep it interesting on the grill, without getting too complicated? Roberta - Thanks for the question, Kirsten. I grill all types of vegetables (zucchini, squash, eggplant, meaty portobello mushrooms and red onions. My husband tells me he could easily be a vegetarian with vegetables as tasty and satisfying as these. I mix two tablespoons if mustard with a quarter cup of olive oil, thyme and garlic salt. Coat the vegetables with the mixture and let them marinate for 30 minutes to an hour. Then grill. These are the perfect accompaniment to a big green salad, couscous, etc. they also make a great panini filling. Another idea is to slice potatoes in rounds and layer them in foil (that has been sprayed with non-stick Pam). Layer the potatoes with onions and gruyere cheese, salt, pepper and a bit of butter. Deal the foil packet tightly and grill. What could be more refreshing in the summer than a chilled fruit soup? This Chilled Cantaloupe Soup with fresh Strawberry puree is beautiful to look at and a great way to begin lunch or dinner in the heat of summer. If you have strawberry puree left, it makes a great smoothie. Puree the cantaloupe in a blender until smooth and frothy. Pour the puree into a large non-reactive glass bowl. Stir in the lime juice, and chill until ready to serve. Puree the strawberries in a blender until smooth and place in another non-reactive glass bowl and chill. One hour before serving the soup, chill the soup bowls. 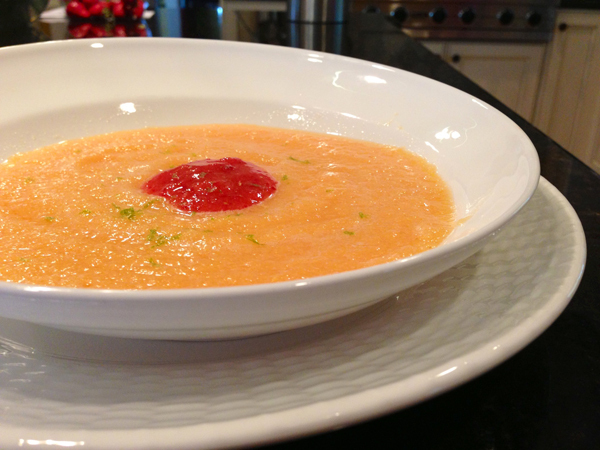 When ready to serve, ladle the cantaloupe soup into bowls and place a tablespoon of the strawberry puree in the center of the soup. Garnish with a sprinkling of lime zest. whipped eggs, meringue, or whipped cream. It has the texture of a frozen mousse, but because it never freezes to a totally solid state, you don’t need an ice cream maker. You can flavor your semifreddo with anything you like, but I have chosen to make mine chocolate with a hint of orange. If you prefer vanilla, substitute six ounces of white chocolate for the dark chocolate. Don’t let the steps overwhelm you…it really is simple to make. Watch the video for instruction. Whip the egg yolks, sugar and vanilla on high speed with a whisk attachment, until the egg yolks become a pale yellow, and the mixture triples in volume. Gently fold the melted chocolate into the egg yolk mixture. In a clean mixing bowl with a whisk attachment, whip the heavy cream and orange zest until the cream thickens and peaks form. Fold the egg mixture into the whipped cream and set aside. In the bowl of the electric mixer, fitted with a whisk attachment, whip the egg whites and salt until stiff peaks form. Fold ½ of the meringue into the chocolate mixture, and then pour the mixture into the bowl with the remaining meringue and continue to fold until the mixture is incorporated. Line a loaf pan with plastic wrap, being sure the plastic wrap is large enough to fold over the top of the pan to enclose it. Spoon the semifreddo into the pan and smooth out the top. Cover with plastic wrap and freeze for a minimum of 6 hours. The Elegant Occasion Note: This can be made a day or two in advance. In a heat proof bowl combine six ounces of dark chocolate with 6 ounces of heavy cream. Microwave for 2 minutes, and then let the mixture sit for another 2 minutes. Stir together until chocolate pieces have completely melted into the cream. The Elegant Occasion Note: This can be made up to 24 hours in advance. To reheat before serving, place container in the microwave for 30 second intervals until just warm. Invert the semifreddo onto a plate and peel away the plastic wrap. Slice into ½ inch pieces and garnish with chocolate ganache. *The Elegant Occasion Note: The Elegant Occasion recommends caution in consuming raw or lightly cooked eggs due to the risk of food-borne illness. Use only the freshest, properly refrigerate, clean, grade A or AA eggs with shell that are intact. Join me every Friday here on the blog and ask away about all your cooking dilemmas. Want to know how to make a perfect poached egg? Why is your chicken always coming out dry? How to make a perfectly cooked steak? Ask away! 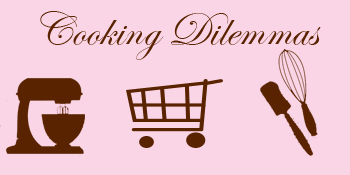 Leave your comments below on this post with all your cooking dilemma questions. Justin - In order to get juicy chicken do you always have to have the skin on? I am trying to be healthier but I am always drying out chicken breasts without the skin on. wendy - How do you make a perfect hard boiled egg? Roberta - Hi Wendy, thanks so much for your question. I make a lot of boiled eggs at my home, as my daughters love them. Here is my fool-proof method for cooking eggs. Place eggs in a saucepan in a single layer. Cover the eggs with cold water and bring the water to a boil. Once the water begins to boil, turn the heat to low and let the eggs simmer for 17 minutes (set your timer to make sure you are exact on this). Immediately place the eggs in cold water to stop the cooking process. The result is a perfect egg, with a yolk that is a lovely vibrant yellow. Roberta - Hi Justin. Thanks for your question, and I totally understand about wanting to eat healthier, as I am always striving to do the same. To achieve this goal and still get a moist, juicy chicken when cooking skinless chicken I make dry rubs and put them on the chicken four hours ahead of time so that they can really seep in to the meat. A great dry rub for chicken is 1 teaspoon mustard powder, ½ teaspoon rosemary, ½ teaspoon garlic salt and ½ teaspoon ground coriander. Then, I drizzle the juice of a fresh lemon over the chicken and cover with plastic wrap. When I use a wet marinade, I typically do a Dijon mustard base mixed with a bit of extra virgin olive oil and one of my favorite vinegars (I always have a variety in my pantry). Again, I let chicken marinate for hours prior to cooking. I hope this gives you some ideas on cooking chicken in a healthier manner, while still retaining moistness and flavor.